Search results for companies within the DJ Roadshows category. Your search returned 77 matches. 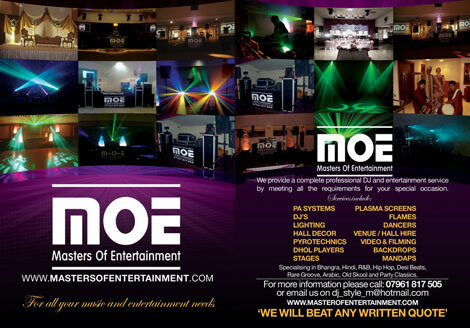 No.1 choice for weddings/parties and all special occasions! dhol players, dancers, lights, screens etc. TRUE PROFESSIONAL Dj's at work playing the music you want to hear. Fun, Fantastic Female Djs for all your wedding, birthday mehndi party needs. Call us now for a competitive quote. 100% Reliable, always professional. We work with your budget. We work with You. We host your event not just sit there and watch the cd's going round. Call us we do it better !! bollywood dj specialist in asian weddings djs our servises proffessinal djs and photography and video film at very resonable prices.